I belong to a group called "Space Hipsters" on Facebook, and the talented artist James Vaughan frequently posts his work there. 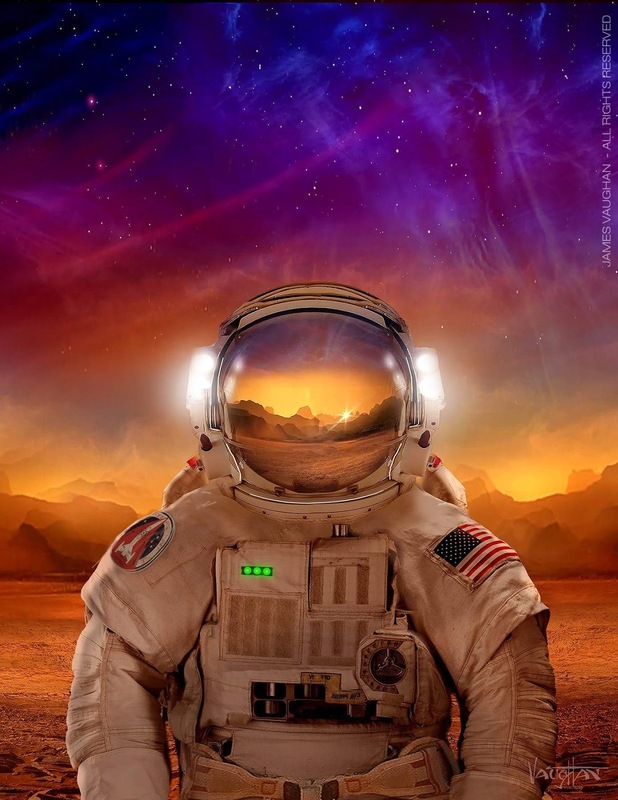 I was struck by this devastatingly beautiful astronaut he created. 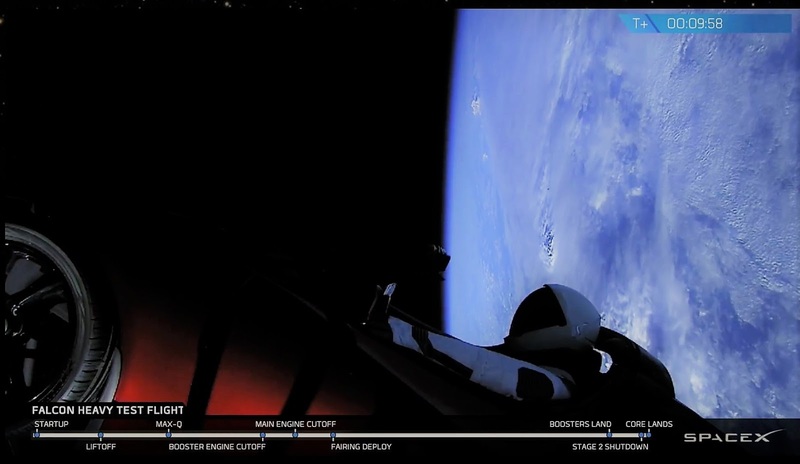 Starman has a much better view now. 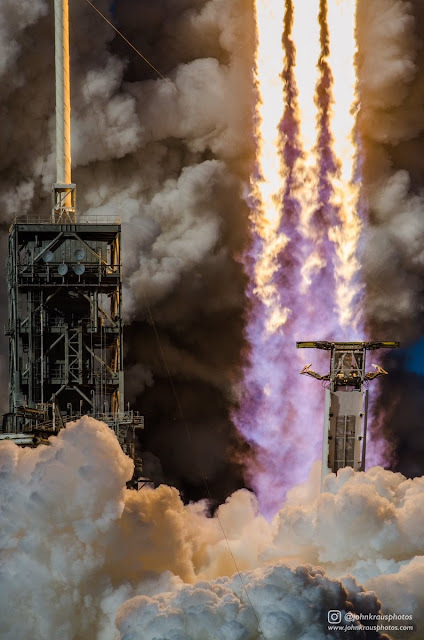 SpaceX had a PHENOMENAL test flight today with their new Falcon Heavy rocket! CEO Elon Musk said there would only be a 50/50 chance of success, probably to head off any expectations of perfection. Although flight and mission details have not been released or fully completed yet, perfection may have actually been achieved. "It was very, very, very impressive," said Richard Hoover, an astrobiologist who has recently retired from NASA. "What he [Elon Musk] did was truly spectacular." The two side cores returned to the ground at the Kennedy Space Center and landed in breath-taking synchronized fashion. It was not clear what happened to the central core rocket, which had been scheduled to land on one of SpaceX's floating autonomous barges ("Of Course I Still Love You"), located 300 miles off the coast of Florida. Although visual contact was lost with the core, that does not indicate any type of failure occurred with the landing. And the Falcon Heavy payload, the beautiful midnight cherry Tesla roadster with its passenger "Starman," was shown cruising smoothly into space with a very blue Earth in the background. "We've never seen rockets land like this before," said Hoover. "It [the two side cores] looked like rockets from the 1940s science fiction movies. We've finally got rockets from the 1940s!" Hoover explained that launch scenes in old movies were shown using actual V2 rocket launch footage in reverse, so it would look like a rocket was landing on the Moon. Hoover also commented how significant SpaceX is to the U.S. space program, since they are now very close to providing human launch capability. The U.S. hasn't been able to launch our own astronauts since 2011, when the 30-year-old Space Shuttle program was retired. "You don't sell your old car before you get a new one, and that's exactly what we did," said Hoover. UPDATE Feb 7, 2018: The middle core did not land on the floating barge. It apparently hit the water approximately 100 meters away from the barge at around 300 mph. The booster was heavily damaged.